Happy 4th of July! I hope you are having a fabulous day with family, friends, flags, and fireworks. No beating around the bush here. I have an issue with portion control. It's ridiculously bad. I serve up portions that are much too large. My kids will eventually learn that they should always have me serve their desserts but never their vegetables. My portion issue is connected to parties and family functions as well. I plan WAY too much food all of the time. With the help of my husband I am getting better. My husband helps me tone it down and not make AS much food. However, we always end up with a ton of leftovers even with my slightly improved portion issues. Fourth of July barbecues, even if it is just with my family, are no different. I have planned more hot dog and black bean burgers than people. However, I want to have options... at least that is what I am always telling myself when planning food for parties. If you are like me, you are going to have some leftover hot dog and hamburger buns after the holiday BBQ. This easy to make, but absolutely delicious Cinnamon Brown Sugar Bread Pudding will be just what you need. This bread pudding uses all of those leftover hot dog or hamburger buns in a delightful way. 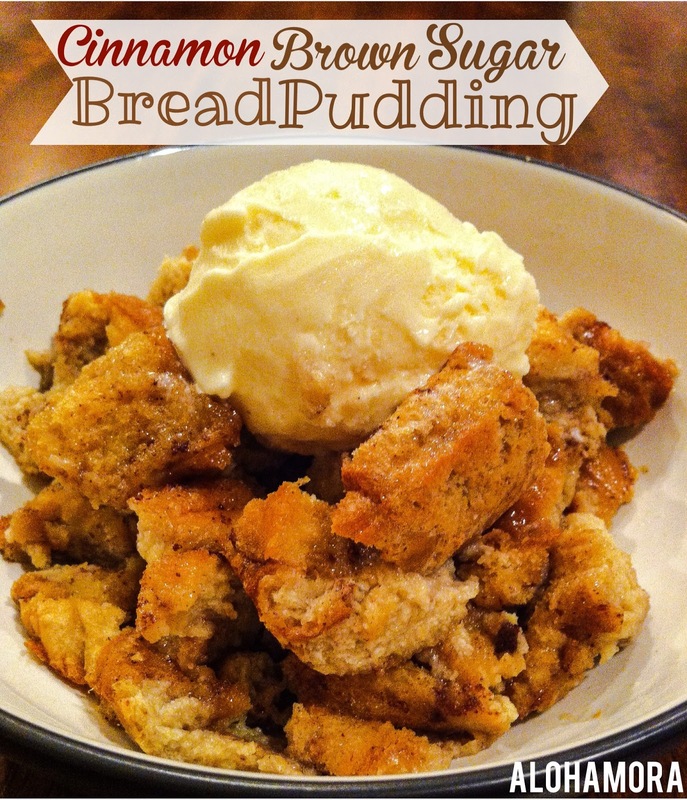 This bread pudding has a rich flavor you will enjoy warm with ice cream or cold for breakfast. Either way, or both ways (as my husband just stated), you will be one happy camper as you eat this up. PS, this recipe doubles well if you have even more leftover bread to use. Spray or grease an 8x8 inch pan. Cut your leftover bread in approximately 1 inch cubes. Feel free to use very hard or stale bread. It will all taste delicious. Evenly distribute the chopped bread in your prepared pan. In a small to medium bowl mix well with a fork or whisk the milk, eggs, 1/4 cup of brown sugar, cinnamon, vanilla, and salt together. Pour the milk mixture over the bread and let it soak everything up for approximately 15 minutes. The harder/more stale the bread the longer you will want to let the milk mixture soak into the bread before baking. Top the bread pudding with the tablespoon of brown sugar and the 1/4 cup of syrup. Bake at 325 for 30-35 minutes or until the custard like filling is set and firm. Enjoy warm with ice cream or whipping cream for dessert, or cold with milk for breakfast. Happy deliciously transformed leftovers aka Cinnamon Brown Sugar Bread Pudding eating!